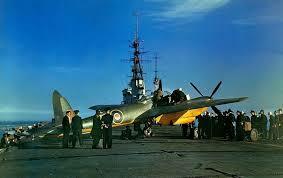 The De Havilland Mosquito served at sea with the RN, and became the first twin-engined British aircraft to land on an aircraft carrier. Its pilot, the redoubtable Eric “Winkle” Brown, is still highly active in the world of aerospace, and regularly travels the UK to give lectures about his many adventures test-flying a plethora of aircraft types. One of these was the Sea Mosquito. The Sea Mossie (properly described as the TR Mk33 after it went into production) was modified for carrier deck flying by the addition of folding wings, an oleo undercarriage (instead of rubber-compression), a nose radome and, most interestingly, larger fixed-pitch four-bladed propellers. Winkle Brown’s talks include stories about the Sea Mosquito, and these confirm that from the beginning the deck-landing version was fitted with those four-bladed non-feathering de Havilland propellers. These actually caused some aerodynamic problems, but it’s unclear exactly what after all these years. I was also intrigued to learn that LR387 (the second prototype) and VT724 (a TR Mk37) also had RATO-bottles fitted – maybe my next experiment with model RATO might feature a Mossie after the Hellcat and Phantom! The problems caused by a combination of a high all-up weight and land-operation-rated engines conspired to produce a nominal stalling speed (with u/c and flaps down) of 110 mph (!) set against a maximum permitted touchdown speed of 83 mph, which was dictated by the carriers’ arrester gear. Of course, there would be ship and wind speed to add into the equation, but these would need to add at least 30mph down the deck to avoid disaster (a similar story to the Mustang carrier trials in the USA, where the margin for error on landing speed was absolutely minimal). So, when you next see John Philipps’ De Havilland Sea Hornet sauntering towards another 100 point landing at the maximum 30 degrees Angle of Attack, you can nod wisely and tell your mates that he’s just doing what the great man did – prop hanging his De Havilland! 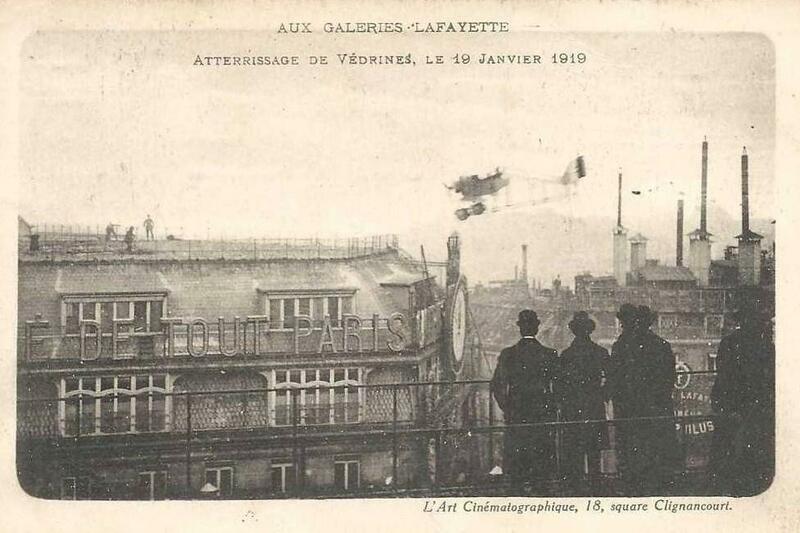 As part of a publicity stunt the Galerie Lafayette in Paris (think of an even more chic Harrods) challenged adventurous (or mad) pilots to land a plane on the roof of their store for a prize of 25,000 Francs. The roof was only about 100 feet above the street below, so the City Council forbade anyone to take part in the attempt. However, on the 19th of January a dare-devil pilot named Jules Védrines succeeded in landing on the roof terrace of the store, making him the first person ever to land on top of a building. He only received 24,994 francs of his prize money, however, as six francs were deducted by the City Council as a fine for landing in a prohibited area! Aircraft carriers are usually designed with decks allowing straight-on, straight-off approaches and landings. Admittedly, the earliest converted warships launched aircraft from the foredeck gun turrets and retrieved them onto their poop deck, but these pioneers were soon superseded by purpose-built vessels with full-length decks. 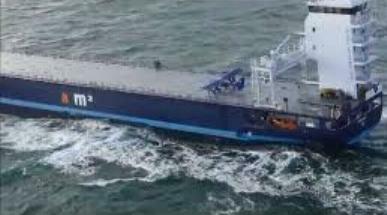 So, who would try to land on a modern cargo ship where the deck approach was pretty much obstructed by a substantial tower housing the crew’s cabins, admin offices and bridge accommodation? Well, here’s proof that some folk really do enjoy a challenge! 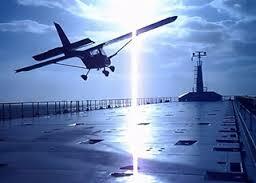 The aircraft is a Foxbat Microlight, and the ship is a innovative high-volume 3,500 tonne freighter. The plane landed and took off, apparently without telling the ship’s crew exactly what they were going to do… the take-off was a wee bit hairy, (check out the video) If our BCD rules eventually change to include models of aircraft that have operated from a ship at sea without an arrester-hook, then this would be an interesting prototype, especially if the ship’s superstructure were to be moved to the end of the deck as per this video! Watch out for some more fun pages over the next couple of weeks, and news of models being built for 2015 in Man-Caves around the world!